There once was a small kingdom around a lake. One very hot summer, it did not rain and the lake dried up. People grew anxious and went to the King. as their children cried with thirst. 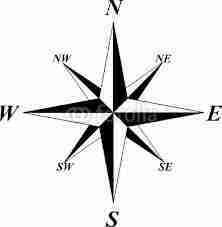 and the fourth followed the North Star. they searched everywhere, but in vain. Three of the generals returned, empty-handed. But the general who had gone north was determined not to fail his King. The general broke off a huge piece, loaded it onto his horse-cart and rushed back home. By the time he reached the court, the enormous icicle had melted into a small lump of ice. Nobody in the court had ever seen ice, so everybody gazed at it with wonder. 'This must be a water-seed!' one of the ministers exclaimed suddenly. 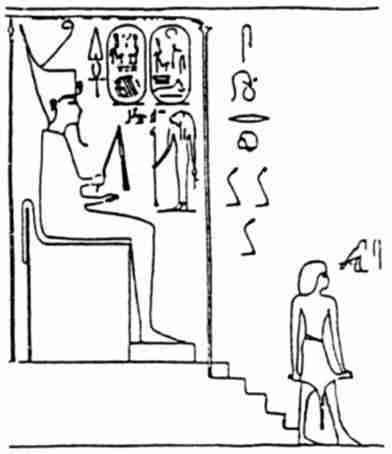 The king ordered the 'water-seed' to be sowed immediately. While the farmers dug a hole, the lump dwindled in the sun. They swiftly placed the seed in the hole, but before they could cover it up, it had vanished. The farmers there grew confused and worried. They dug deeper and deeper into the earth, all night long, looking for the mysterious seed. 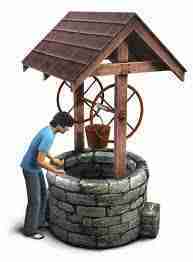 This is how the first well was created. Life on earth depends on water. wide enough to accommodate men with digging tools. doivent creuser des puits pour atteindre l'eau du sous-sol. Buckets are lowered into the well and filled with water. 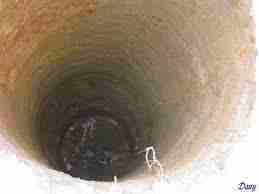 of a well takes great effort . Les seaux sont descendus dans le puits et remplis d'eau. or wind on a windlass. gorge d'une poulie ou s'enrouler autour d'un treuil. The well is surrounded by a low stone wall to prevent accidents. The roof protects the water from impurities. Le puits est bordé d'un petit mur de pierre pour éviter les accidents. Le toit protège l'eau des impuretés. 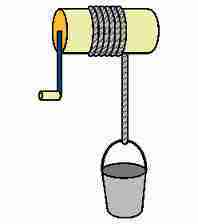 Before the development of modern geology, a dowser was used to locate groundwater. 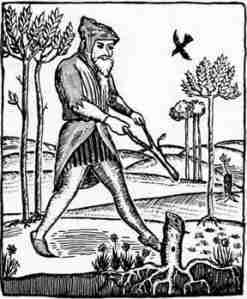 Then the well-digger could begin his work..
A dowser was also called 'a water witch'. l'eau souterraine, ensuite le puisatier pouvait commencer son travail. 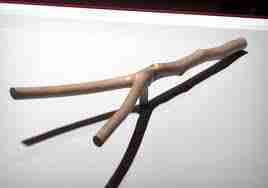 To find underground water, a dowser uses a rod or forked tree branch. He holds it in front of him and begins walking. When water is discovered, the rod or forked tree branch gives a signal. It will dip or twitch. Quand il y a de l'eau la fourche l'indique, elle se baisse ou vibre. Not all dowsers use a Y-shaped rod. Some of them prefer L-rods. Others practise with a pendulum. Les sourciers n'utilisent pas tous une baguette en forme de 'Y'. The origin of dowsing dates back about 8000 years. datent d'à peu près 8 000 ans. This man is Danish. He is looking for water with a willow twig. When he finds it, the signal is so strong that the twig breaks. Cet homme est danois. Il cherche de l'eau avec une baguette de saule. Quand il la trouve le signal est si fort que la baguette se casse. Do dowsing rods really work? Les baguettes de sourcier fonctionnent-elles vraiment ? Personne ne sait réellement. De nombreuses personnes, surtout les scientifiques, sont sceptiques. du système nerveux humain à certains facteurs qui nous sont encore inconnus. remarque : certains utilisent la radiesthésie à d'autres fins que la recherche de l'eau. the ninthninethnithI don't know would have stayed at home. The fourth general has a black beard => He is a black beardedblack-beardedbeard-blackedI don't know man. The king has a kind heart => He is a kind heartedkind-heartedheart-kindedI don't know person. The old woman points at the cave with her right hand => She is a right-handedright handedhand-rightedI don't know woman. 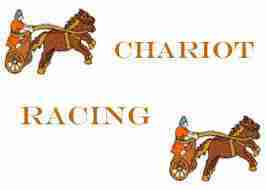 The generals' chariots have two wheels => The generals drive two-wheelsedtwo wheeledtwo-wheeledI don't know chariots. Why did the king order the farmers to sow the lump of ice? When did the king discover water at the bottom of the hole? 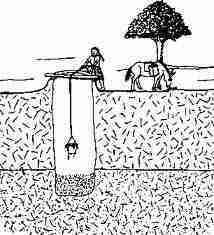 In the past, people dug wells with a shovelrakedibbleI don't know . 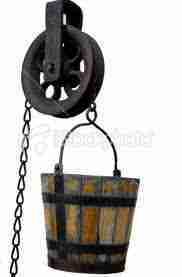 To raise heavy buckets, you can wind a rope round a cylinder by using a groove wheelhand crankwindlassI don't know . A man who searches for underground water with a rod is a warlockdowsersorcererI don't know . used in divination and dowsing.